Partnerships for Forests and TechnoServe are working together to protect Ethiopia’s ecologically unique and biodiverse habitats while increasing the livelihoods of forest coffee farmers. “We were handed the forest by our parents, and we must preserve it,” says Amanuel Trefe (pictured above, right), before setting off into the Gabrebecho Forest in western Ethiopia’s Kaffa zone. The 1,300-hectare woodland is home to dozens of species of birds, primates, and other wildlife, as well as towering trees and medicinal plants. But the young man is looking for something specific: wild forest coffee. Across western and southern Ethiopia, hundreds of thousands of people like Amanuel still harvest wild coffee from the forests every year, just as the world’s first coffee drinkers did. Maturing slowly under the shade of the forest canopy, the coffee has a rich, distinct flavor; farmer Wosenech Koyse drinks the coffee she harvests from the forest and can easily tell it apart from garden-grown coffee. “It is sweeter when I roast it,” she says. Wosenech Koyse is a coffee farmer and member of the Fanika cooperative in Bench Maji, Ethiopia. 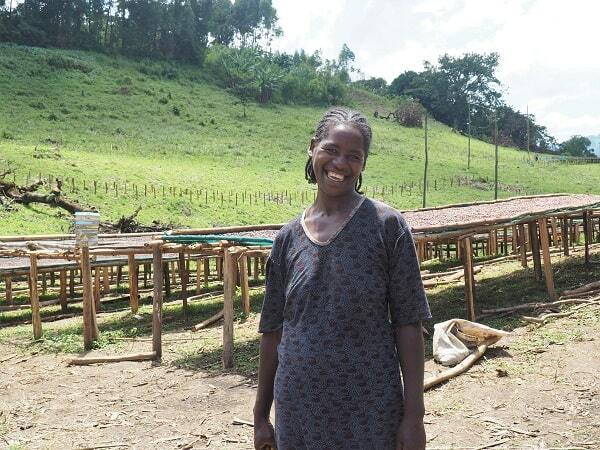 She is earning a better price for her coffee from the cooperative than she was previously from private traders – enabling her to send her five children to school. Photograph: TechnoServe. As a unique product, forest coffee has the potential to be an important source of income in impoverished communities and create a strong incentive to protect the forests, which face pressure from a growing rural population in need of farmland and timber. Since 2018, Partnerships for Forests and TechnoServe have been working to change this reality. Funded by the UK Department for International Development, the project is working to help forest-coffee producers access premium markets that offer better prices. This will generate better livelihoods in the communities surrounding the forest, help to protect an ecologically unique and biodiverse habitat, and conserve the largest bank of wild coffee plant varieties for future breeding. Farmers pick coffee cherries in the Didebe forest in Ethiopia. Photograph: TechnoServe. TechnoServe is collecting samples from dozens of cooperatives and private wet mills that process forest coffee and will create flavor profiles and the first detailed map of the forest coffee regions; and with this information in hand, the organization will help market the coffees to exporters, building connections between forest coffee growers and profitable markets. Meanwhile, project partner GIZ is working to improve the consistency and traceability of the coffee, so that it meets the quality standards of discerning buyers. Ultimately, the project is expected to help more than 10,000 farmers earn better incomes and promote the conservation of 150,000 hectares of forest. Farmers in the region understand the role that the forest plays in their livelihoods. “The farmers believe that without shade trees, they can’t sustain their coffee. 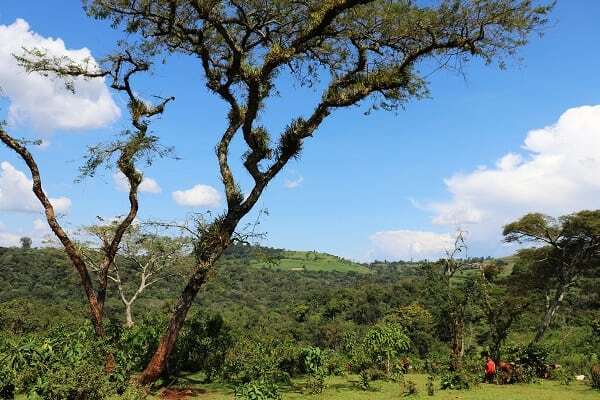 Managing the forest is very important for them,” said Asnake Nigat, a former TechnoServe business advisor and the current manager of the Katamudga Cooperative Union. At the Ufa Farmers’ Cooperative, where Amanuel Trefe serves as the accountant, 70 percent of the coffee grows under the canopy of Gabrebecho, and the farmers also serve on a participatory forest management (PFM) committee, which sets and enforces rules for how community members are allowed to use the forest. Better prices will increase the incentives to protect the forest as a vital economic resource. 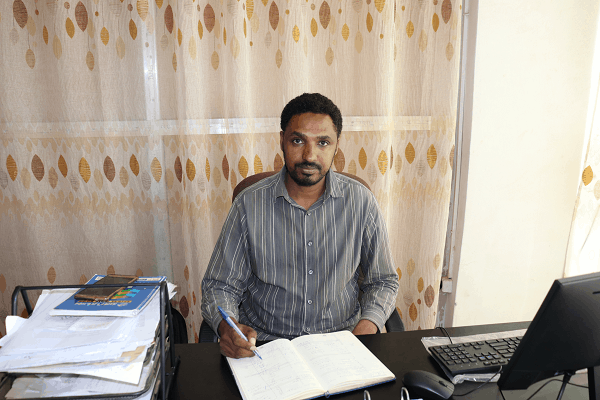 Asnake Nigat manages the Katamudga Cooperative Union. Photograph: TechnoServe. Even cooperatives that have been able to access specialty markets view forest-grown coffee as a way to diversify their incomes. In Jimma zone, coffee growers came together to launch the Nanochalla cooperative in 2010. “We formed the cooperative to grow together. The cooperative is for all. The poor as well as the rich,” explains cooperative chairperson Xilaahun Mamo. 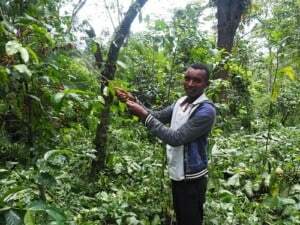 The cooperative participated in TechnoServe’s Coffee Initiative, which helped it to produce and sell premium coffee, but it is eager to find buyers for its wild forest coffee. Xilaahun Mamo, Nanochalla cooperative chairperson, with Sitina, a leader from the cooperative. Photograph: TechnoServe. 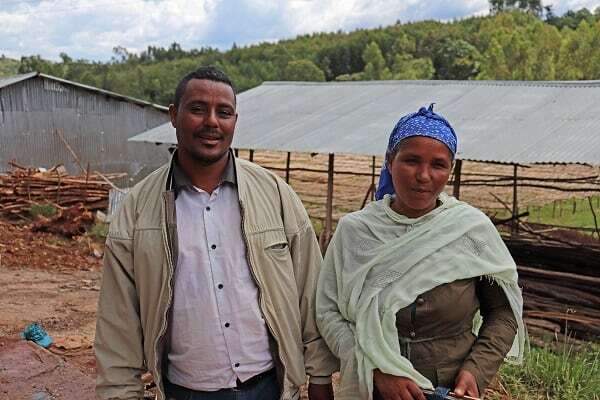 For the farmers at Nanochalla, Ufa, and dozens of other cooperatives and communities spread across Ethiopia’s forests, the project offers the opportunity for better livelihoods and healthier forests. Back in the Gabrebecho Forest, Amanuel and his neighbors descend a narrow path that weaves around massive trees. There, they see them: bright red coffee cherries, standing out amid the green underbrush of the forest. They begin to harvest, knowing that the beans inside will soon be in the cups of coffee drinkers around the world.